Lush, detailed illustrations and lyrical fairytale-style writing about a small village faced by an ancient enemy dragon make this a not-to-be-missed graphic novel. As a stand-alone this would be a perfect introduction for readers new to graphic novels. I had expected the story to lean on the standard trope of the world's last known dragon being a misunderstood, lonely creature, who depends on the hero to keep magic alive in the world but instead I was pleasantly surprised to find that in this world, dragons are nothing more than overgrown, dangerous fire-breathing lizards which the human community is more than happy to wipe out. The village healer's daughter Tansy is a bit of an outsider in the community and even her sisters, practical Rosemary and flibbertigibbet Sage, fail to understand her. She alone is underwhelmed when a blowhard (but gorgeous) youthful hero, Lancot, sweeps into town, bragging of his battle prowess. After the town begins to suspect that their missing sheep (and missing children!) are due to a young hungry dragon, naturally they call on the tow-headed stranger to solve their problem. In a panic, he realizes that his plan of boasting and bluffing his way through this hick town have backfired on him, and his thought bubbles and facial expressions in the next several panels are humorous indeed. Tansy comes to the rescue with a clever plan to outwit the dragon, using Lancot's true skill: kitemaking. It's a bit of a stretch to believe that battling a blast of dragon fire would reduce Lancot's Fabio-like locks to a manly, yet still handsome crewcut, but I was willing to roll with it. This is a very approachable graphic novel sure to appeal to both boys and girls, with gorgeous sepia-toned full-color illustrations and rich language. I highly recommend it! I'm looking forward to this one lots and lots! The artwork is gorgeous, I had it as a desktop background for a while. 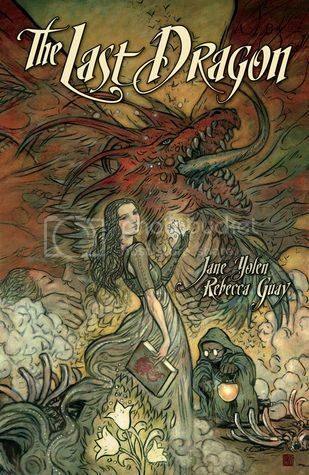 I am a huge fan of Jane Yolen -- and I have this on order for my library. Can't wait!